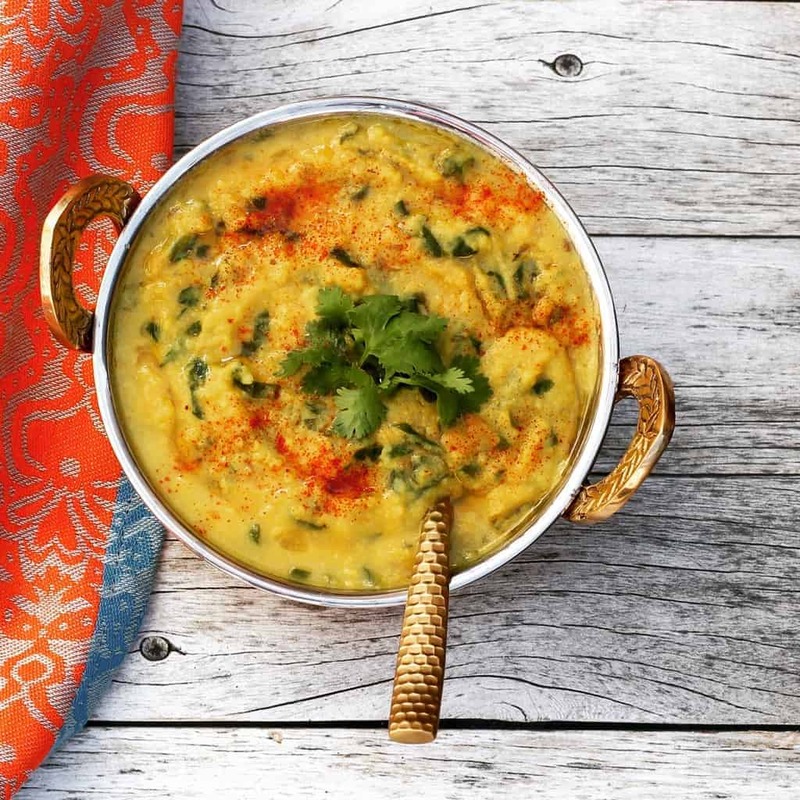 Spinach Daal – A staple in Indian homes, daal is a healthy lentil dish cooked in ghee with healthy and whole some ingredients like tomatoes, garlic and spinach. Best way to make it is in a pressure cooker or an Instant Pot! 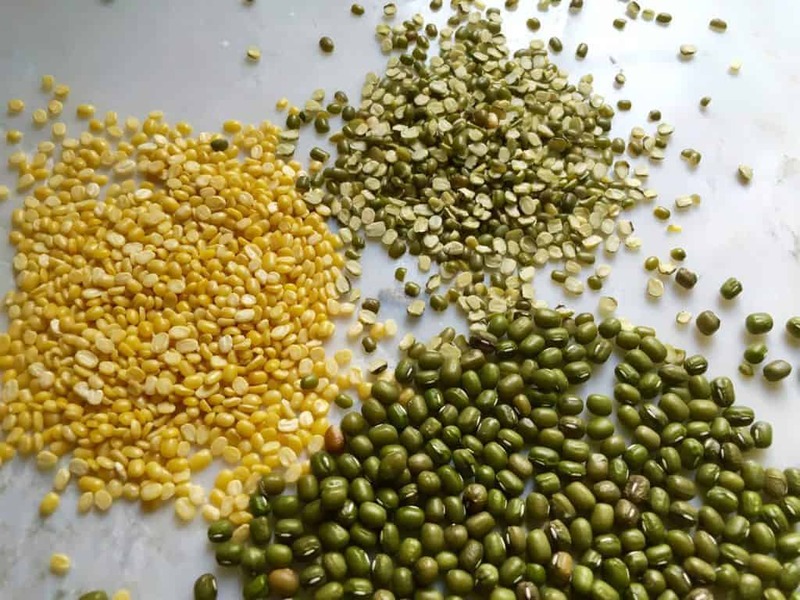 A few weeks back I published a post on Indian Pulses. The lentils I used for making today’s spinach daal in Instant Pot are the ‘split and skinned green gram’. These are small yellow lentils that cook super fast. 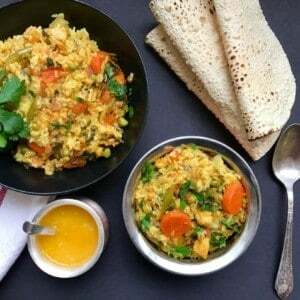 Yellow pigeon peas or split red lentils would be my other two favorite lentils to make this daal. 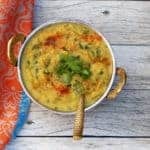 Spinach Daal - A staple in Indian homes, daal is a healthy lentil dish made in ghee with healthy and whole some ingredients like tomatoes, garlic and spinach. Turn Instant Pot on. Once the "hot" sign displays, add ghee. Add cumin and cook for 30 seconds. Add turmeric, green chilies, garlic and curry leaves. Mix well. Close Instant Pot with pressure valve to sealing. Set Instant Pot to Manual(HI) for 15 mins. Allow Natural pressure release or do Quick Release, after, about 5 mins of NPR. Add more water, about 2 cups, to bring the lentils to desired consistency. Blend the daal using immersion blender. Add chopped Spinach and mix well. Cook on Sauté mode until the daal come to gentle boil. Turn IP off. Add more water if required. Adjust salt to taste. Everyone has a different consistency they like for the daal. I usually put about 4-5 cups of water for 1 cup of lentils. 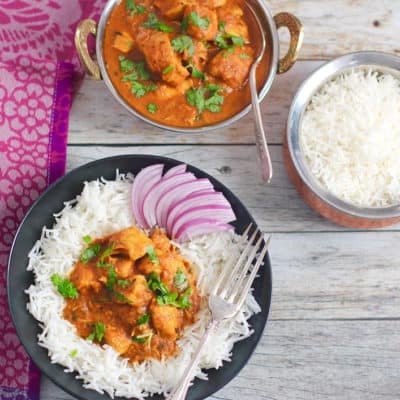 Cook Time for this recipe can also be reduced to 8 minutes! Awesome! Please let me know how you like it. Although I make a spinach curry and of course makes lots of types of dal… this one is new to me.. I will have to try it. Thank you Annika! 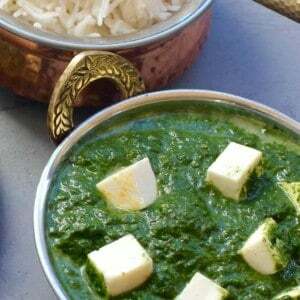 It incorporates spinach beautifully making the daal healthier. Delicious! My kids weren’t too thrilled, but they loved it & asked for it in the lunch tomorrow. Thank you! Thank you for the feedback Becky! I am glad that they wanted it for lunch. So healthy and good for them. I made this last night with a few substitutions. I had half cup of red and half cup of green lentil – they might have been whole not split. I soaked for 20 minutes. I also added kale instead of spinach. Overall the taste was good, but texture was not perfect . Next time, I will add more water after and blend more. Thank you for recipe. I like your idea of using kale in this recipe. I love kale and I am sure it must have tasted delicious. I have to agree that I do end up adding more water sometimes when I want a more soupy consistency. Thank you. I love this dish! I have made it three times already. I can’t to try more of your recipes. 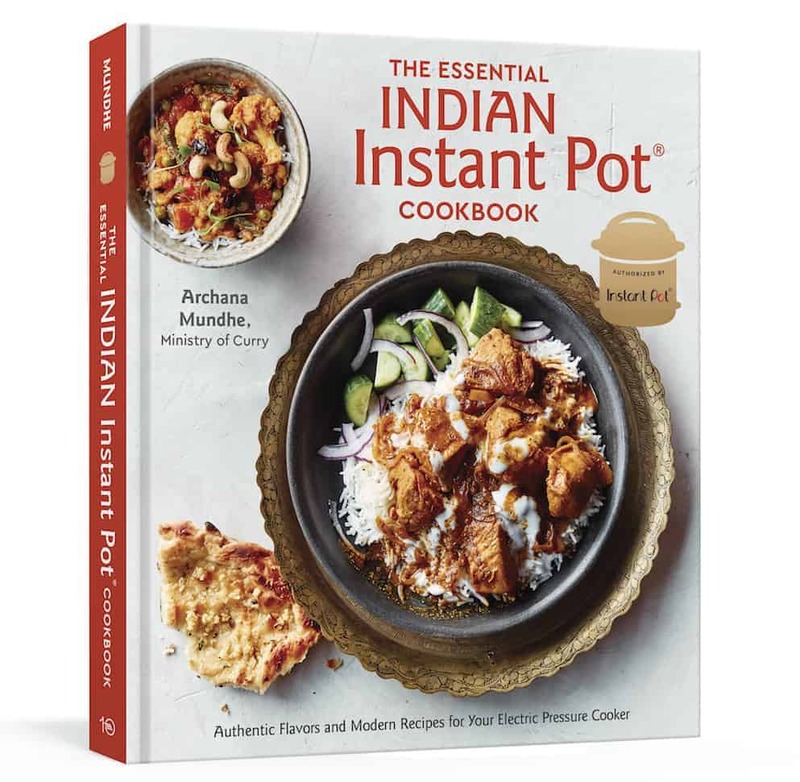 I am so glad these are written for the Instant Pot. Thank you! Thank you!So glad to hear that you are enjoying this recipe. We make this once a week too! 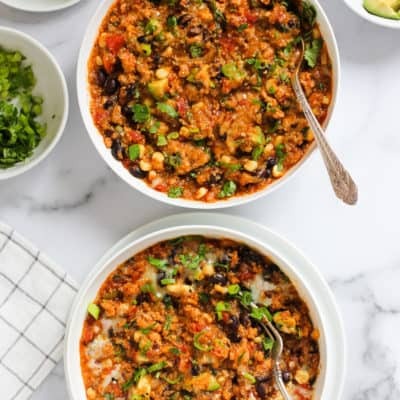 So healthy and the Instant Pot makes it very easy. Do try rest of my recipes! This looks terrific. I can hardly wait to make it. 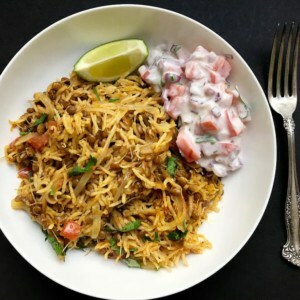 Archana, did you use yellow moong for this recipe? Hi Preeti, Yellow moong daal or masoor daal work well for this recipe and cook time I have specified. Archana! We tried this one tonight and all thought it was excellent. I don’t happen to have curry leaves (we live in the middle of nowhere) and I used beet greens from the garden instead of spinach, Tomatoes are not yet ripe, but canned did work. Actually, I couldn’t believe how insanely EASY the recipe was; I kept checking to make sure I had not messed up. THIS is happening again! Thank you again and I really appreciate the time and effort you put into this blog! Hi Wendy! Awesome! This notes makes me SO happy. I love beet greens and its a great idea to add any greens you like, we sometimes make this with dill or chard too! This recipe is our family recipe that we make once a week. It is also a good make ahead dish. Thank you for trying the recipe and taking time for giving me the feedback. Thank you! Thank you!! Hi Archana, do the lentils need to be soaked in water? If soaked, will it still be 15 min on manual mode? Hi! Lentils do not need to be soaked. If you do soak them reduce the cook time to 10 mins. Do you soak your lentils or not? I’ve tried not soaking them and had tummy troubles. Advice? This recipe looks so yummy! How long do you need to soak the whole lentils? Does this change the cook time also? Hi Lenisa! If you are talking about whole brown lentils, they do not need soaking. They will cook in same time. What about while red lentils? Thank you! Same cook time for red lentils. Came out really good. Was a little skeptical because there was no onions or ginger. I really enjoyed it! Don’t you wash lentil before adding ? Not the one’s I buy here in the US. Turned out fabulous! 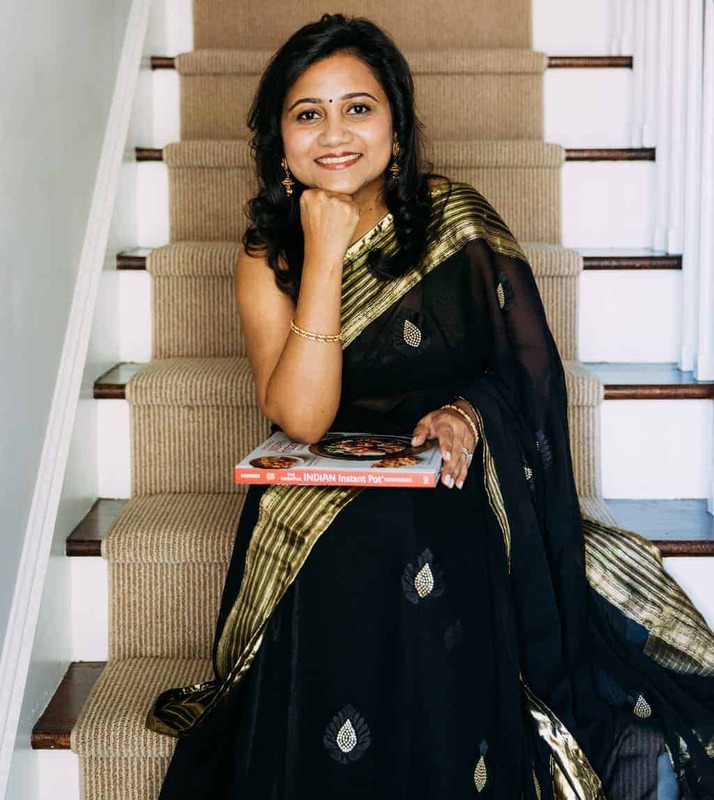 Archana, thanks so much for the recipe! Have been making this every week since I got my Instant Pot. Our favorite IP recipe from you! Thanks! Hi Sharon! Thank you for your lovely feedback. I am so happy to read this. Again, great recipe. Very flavourful. Next time, I will put less water at finish to get more texture and flavour. Hmmmmm…maybe more garlic and green chilies? Details. All your recipes are wonderful. Thank you, Archana! Thank you Louise! Yes you can absolutely add more garlic and green chilies for a spicier daal. I am posting another variation of this recipe soon with pot in pot rice. Hi! Checking out your great recipes and had a question please; what if you don’t have an immersion blender!? Can you use something else?